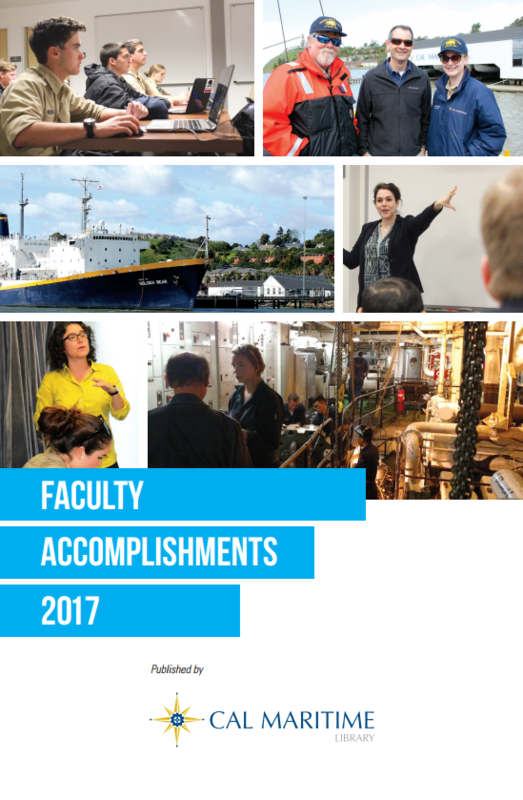 Browse the booklet of faculty publications and presentations from the 2016-2017 academic year. Opp, S., Benton, G., & Moser, G. (2017, April). Faculty engagement with retention and attrition data: The ebb and flow of student progress. Presented at WSCUC Academic Resource Conference, San Diego, CA. Saarheim, S., & Browne, S. D. (2016, October). Assessment of STCW competencies aboard a maritime academy training vessel. Presented at the International Association of Maritime Universities General Assembly, Haiphong, Vietnam. Coates, N. E. (2016, February). Solution-processed nanocomposites for better neutron detectors and thermoelectrics. Presented at the Physics Department at Portland State University, Portland, OR. Coates, N. E. (2017, March). Capacitance in nanoscale bulk-heterojunction materials. Presented at the American Physical Society March meeting, New Orleans, LA. Dewey, C. (2017, March). 'Its a mutual, joint-stock world': Maritime trade and the circuits of capitalism. Presented at the American Society for Eighteenth-Century Studies annual meeting, Minneapolis, MN. Dewey, C. (2017, January). There and back again: Lyric poetry and the disorientation of commerce. Presented at Cal Maritime Scholar Series, Vallejo, CA. Dewey, C. (2016, August). Circulation and its discontents: Coleridge, lyric, and the 'British ocean.' Presented at the North American Association for the Study of Romanticism annual conference, Berkeley, CA. Hartman, B., & Clott, C. (2016, August). Chassis pooling and profit allocation. Presented at the International Association of Maritime Economists IAME Conference, Hamburg, Germany. Clott, C., Hartman, B., & Cannizzarro, R. (2016, August). Standardization and differentiation of container shipping alliances at U.S. ports. Presented at the International Association of Maritime Economists IAME Conference, Hamburg, Germany. Higdon, N. (2016). Junk elections and the façade of democracy: The corporate media’s 2016 war on social justice. In Huff, M., & Roth, A. L. (Eds. ), Censored 2017: Fortieth Anniversary Edition. New York, NY: Seven Stories Press. Higdon, N. (2017). Effective critical media literacy pedagogy in higher education: Turning social justice theory into practice. Panelist at Critical Media Literacy Conference, Savannah, GA.
Higdon, N. (2016). Power dynamics and problem solving: Engaging both to explore civic and community engagement. Panelist at Media Freedom Summit, Cotati, CA. Higdon, N. (2016). Effective critical media literacy pedagogy: Turning social justice theory into practice. Panelist at the Union for Democratic Communications Conference: Troubled Waters, Detroit, MI. Higdon, N. (2016). 9/11: A teachable moment: Social justice pedagogy in a post-9/11 world. Panelist at 9/11 Film Festival, Oakland, CA. Higdon, N. (2016). What can community colleges and four-year institutions teach each other about social justice? Panelist at the National Conference on Race and Ethnicity (NCORE), San Francisco, CA. Higdon, N. (2016). Social justice pedagogy in the digital age. Panelist at the Action In Media Education Summit, Fairfield, CT.
Holden, M. E. (2016, November). Who's the captain now? Presented at Cal Maritime Scholar Series, Vallejo, CA. Holden, M. E. (2017, March). Autonomous vehicles. Lecture presented at Cal Maritime Women in Maritime Leadership Conference, Vallejo, CA. Hanson, M., & Janssen, A. (2017, February). Separating the sizzle from the steak: Evaluating classroom technologies for effective implementation. Presented at Lilly Conference on Evidence-Based Teaching and Learning, Anaheim, CA. Lewis, T., & Oppenheim, T. (2016) Integrating a business minor with an engineering course of study. Journal of Management and Engineering Integration, 9, 100-109. Lewis, T. (2017, April). Coming ashore: Seafarer turnover in the U.S. shipping industry. Presented at Cal Maritime Scholar Series, Vallejo, CA. Lewis, T., & Oppenheim, T. (2017, March) Antecedents of seafarer turnover in the U.S. commercial shipping industry. Presented at IEMS 2017 General Conference, Cocoa Beach, FL. Moorhead, K., Dronkert, G., Aqurie, T., Rose, J., Caughlan, S. (2016, December). Electric/hybrid vessel: The big picture, technical aspects, lessons learned. Presented at MARAD Marine Hi-power Battery Workshop, Department of Transportation, Washington D.C.
Glibert, P. M., Wilkerson, F. P., Dugdale, R. C., Raven, J. A., Dupont, C. L., Leavitt, P. R., Parker, A. E., Burkholder, J. M., & Kana, T. M., (2016). Pluses and minuses of ammonium and nitrate uptake and assimilation by phytoplankton and implications for productivity and community composition, with emphasis on nitrogen‐enriched conditions. Limnology and Oceanography, 61(1), 165-197. Parker, A. E., Blaser, S., & Wilkerson, F. P. (2017, March). Understanding Microcystis carbon and nitrogen physiology in the San Francisco Estuary Delta: results from surveys and experiments. Presented at Interagency Ecological Program for the SFE Annual Meeting, Folsom, CA. Parker, A. E., Wilkerson, F. P., Dugdale, R., Blaser, S., Lee, J., & Lee, T. (2016, November). Characterization of the impacts of the Emergency Drought Barrier on nutrients and phytoplankton in the lower San Joaquin River. Presented at Biennial Bay Delta Science Conference, Sacramento, CA. Parker, A. E., Stumpner, L., Bergamaschi, B., Wilkerson, F. P., & Dugdale, R. C. (2016, April). Phytoplankton communities in the tidal wetlands of the northern San Francisco Delta under Drought Conditions. Presented at California Estuarine Research Society Conference, Long Beach, CA. Parsons, A. (2017). Keeping up with the Morrells: Sailors, masculinity and American identity at sea. In Mentz, S. & Rojas, M. (Eds. ), The Sea and Nineteenth-Century Anglophone Literary Culture (66-82). New York, NY: Routledge. Pinisetty, D., & Devireddy, R. V. (2016) Microscale Thermoelectric Devices for Use with Biosystems. In He, X. & Bischof, J.C. (Eds.) Multiscale Technologies for Cryomedicine (173-220). Singapore: World Scientific. Powell, S. (2016, September). The changing tide of education in the digital age. Presented at 16th Biennial National Harbor Safety Committee Conference, Portland, OR. Saarheim, S. (2016, September). Making the case for using digital methods to ease the burden of STCW: STCW and its impact on maritime universities. Presented at 16th Biennial National Harbor Safety Committee Conference, Portland, OR. Sammler, K. (2016). The deep Pacific: Island governance and seabed mineral development. In Stratford, E. (Ed. ), Island Geographies: Essays and Conversations. New York, NY: Routledge. Sammler, K., & Lynch, C. (2017, April). Spaceport America: Contested offworld access and the everyman astronaut. Presented at American Association of Geographers Annual Meeting, Boston, MA. Sammler, K. (2017, April). Material, technical, and political constructions of sea level. Presented at American Association of Geographers Annual Meeting, Boston, MA. Sammler, K. (2016, October). The whale and the kauri tree: New Zealand environmental governance from mountains to sea. Presented at Association of Pacific Coast Geographers Annual Meeting, Portland, OR. Sammler, K. (2016, August). Territory, sovereignty and political geometry in the Pacific Ocean. Presented at International Geographical Congress, Beijing, China. Sammler, K. (2016, April). Common heritage or private commodity: political geography of sea, air, & space. Presented at Association of American Geographers, San Francisco, CA. Senk, S. (2016). Mourning's spiral: Trauma, time, and memory in Derek Walcott's Omeros. Symbolism: An International Annual of Critical Aesthetics, 16, 35-51. Senk, S. (2016). Rethinking Rupture. [Review of Insurgent Testimonies, by N. M. Rizzuto]. Contemporary Literature, 57(3), 453-461. Senk, S. (2016). Attention to the text: Delay and the “ADD Generation." Transformations: The Journal of Inclusive Scholarship and Pedagogy, 25(2), 78-95. Senk, S. (2017, March). Mourners in outer space. Presented at University of Hartford Humanities Center Lecture Series, West Hartford, CT.
Senk, S. (2017, February). Nationalism and memory at the 9/11 Memorial. Presented at Cal Maritime Scholar Lecture Series, Vallejo, CA. Simons, J. (2016, December). Investigating life’s mysteries with mathematical modeling. Presented at Cal Maritime Scholar Lecture Series, Vallejo, CA. Simons, J. (2016, October). Rodents of unusual sperm and other topics. Presented at Seminar for the Center for Computational Science, New Orleans, LA. Simons, J. (2016, October). Rodents of unusual sperm. Presented at International Symposium on Biomathematics and Ecology Education Research, Charleston, SC. Sinha, A. (2017, March). Hearing them out: Understanding student self placement in California and beyond. Presented at Conference on College Composition and Communication, Portland, OR. Sinha, A. (2017, March). Implementing Directed Self Placement (DSP) at different contexts: the struggles and successes. Presented at Conference on College Composition and Communication, Portland, OR. Sinha, A. (2017, March). Network of Directed Self Placement—Changing assessment & placement practices. Presented at Conference on College Composition and Communication, Portland, OR. Sinha, A. (2017, February). Implementing Directed Self Placement. Presented at Writing Research Across Borders, Bogota, Colombia. Sinha, A. (2017, February). Writing programs worldwide. Presented at Writing Research Across Borders, Bogota, Colombia. Sinha, A. (2016, June). International WAC/WID mapping project: Writing programs worldwide. Presented at International Writing Across the Curriculum Conference, Ann Arbor, Michigan. Sinha, A. (2016, April). The struggles and success of implementing Directed Self Placement (DSP) at a first year writing program. Presented at American Association for Applied Linguistics, Orlando, Florida. Trevisan, C. S. (2017, February). The Fate of quantum superposition. Presented at International and Transdisciplinary Symposium on Advanced Future Studies, Kyoto, Japan. McCurdy, C. W., Rescigno, T. N., Trevisan, C. S., & Lucchese, R. R. (2016, May). An unambiguous signature in molecular frame photoelectron angular distributions of core hole localization in fluorine k-edge photoionization of CF4. Presented at Annual Meeting of the APS Division of Atomic, Molecular and Optical Physics (DAMOP 2016), Providence, RI. Slaughter, D., Trevisan, C. S., Weyland, M., Dorn, A., Douguet, N., Orel, A., Adaniya, H., McCurdy, C. W., Belkacem, A., & Rescigno, T. N. (2016, May). Bond formation and bond scission dynamics in polyatomic molecules revealed by momentum imaging experiments and electron scattering calculations. Presented at Annual Meeting of the APS Division of Atomic, Molecular and Optical Physics (DAMOP 2016), Providence, RI. Trevisan, C. S. (2016, July). Calculation of entrance amplitudes for dissociative electron attachment and detection of core hole localization in x-ray photoionization. Presented at Berkeley Lab Undergraduate Faculty Fellowship (BLUFF), Lawrence Berkeley National Laboratory. Van Hoeck, M. (2017, February). The empty syllabus: What can students and employers tell us about information literacy? Presented at Spartanburg Community College, Spartanburg, SC. Van Hoeck, M. (2016, June). What can we learn from students about the research process? Presented at Learning Regions Symposium, Spokane, WA. Yip, F. L., Rescigno, T. N., & McCurdy, C. W. (2016, May). Fully differential single-photon double ionization of magnesium. Presented at Annual Meeting of the APS Division of Atomic, Molecular and Optical Physics (DAMOP 2016), Providence, RI.